The Firm (the Code 34619277) operates on the basis of entering into the Register of Auditors and Auditing Entities No. 3886, which is published on the website of the Audit Chamber of Ukraine https://www.apu.com.ua. According to national legislation requirements the Firm was included by National Committee of securities and stock market in List of audit firms that can provide audit services to financial organizations that operate on stock market. AF “PKF UKRAINE” in 2008 obtained status of member firm of network of legally independent firms PKF International Limited . PKF International Limited is a worldwide network which consists of over 400 offices, operating in 150 countries across five regions. According to the latest International Accounting Bulletin world survey published in February 2018 PKF International Limited were ranked 15th under leading networks. AF “PKF UKRAINE” is a member of the Chamber of Commerce & Industry of Ukraine and the Association of Ukrainian audit firms, which united leading audit firms for developing and improving audit profession, to render quality auditing services. 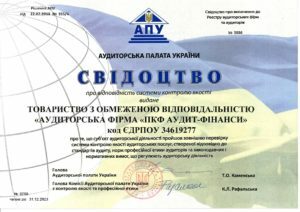 In 2018, once again, PKF UKRAINE was reviewed by the Control Committee of the Accounts Chamber of Ukraine for audit activities and was recognized to have successfully passed the external control of the professional services quality control system in accordance with the Decision of the Audit Chamber of Ukraine of 22 / 02/2018 No. 355/4.